I’ll cut to the chase: “The Man Who Killed Don Quixote” is the odds-on favorite to top my Worst Movies Of 2019 list. 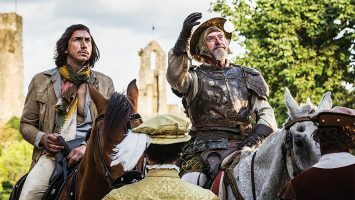 Writer/director Terry Gilliam had — for a long time — tried to make a contemporary re-telling of Miguel de Cervantes’ 16th century tale of a madman who (literally) tilts at windmills. Gilliam first mounted a production in 2000, with 70-year-old French actor Jean Rochefort learning English so he could play the Spanish character Don Quixote opposite Johnny Depp. Gilliam also allowed a documentary crew to film those proceedings, which started badly and quickly turned worse, almost comically. The result was that Gilliam’s movie was shut down while the doc, “Lost In La Mancha,” went on to film festivals worldwide. In 2008, Gilliam tried again, with his onetime Monty Python colleague Michael Palin playing Quixote opposite Depp, but that fell apart. The following year, he announced his new stars would be Ewan McGregor and Robert Duvall, but filming never started on that one, either. In 2015, John Hurt was signed to play Quixote, then developed pancreatic cancer and had to drop out. There was another attempt with Palin which also fizzled, before Jonathan Pryce was signed to play the old man opposite Adam Driver. Finally, after all those years adrift, it was full speed ahead for Gilliam’s pet project, and the movie was actually made. My knowledge of the Quixote legend comes entirely from “Man Of La Mancha,” which opened off-Broadway in 1965. The show was a major hit. After three years off-Broadway, it moved to a bigger theater on Broadway, and played for another three years, a total of over 2,300 performances, winning five Tonys including Best Musical and Best Actor for Richard Kiley. My parents went to see it, enjoyed it, and brought home the original cast album, which they played for me (age seven), as they shared the story of a man whose mental illness makes him believe he’s a knight roaming the Spanish countryside to do good deeds, accompanied by his sidekick, Sancho Panza, and a prostitute he must protect named Dulcinea. We listened to it so often (with me playing Sancho to my father’s Quixote), I knew all the songs by heart, including “The Impossible Dream,” which immediately became a standard covered by every baritone with a microphone. The stage show was turned into an absolutely terrible 1972 movie starring the horribly miscast Peter O’Toole, who was never known for his ability to carry a tune. He’d signed on to what he thought would be a non-musical, but when director Arthur Hiller insisted the songs be included, O’Toole did his best, which wasn’t that good. So, Simon Gilbert was brought in to Marni Nixon the songs for O’Toole, but he wasn’t much better. The English accent didn’t help for the role of a Spaniard, nor did Sophia Loren as Dulcinea with an Italian accent. The only one who acquitted himself was James Coco as Sancho Panza. I’ve never liked any of Gilliam’s post-Python movies (“Jabberwocky,” “Time Bandits,” “Brazil,” “The Fisher King,” etc. ), so why would I see his new one? Because in the back of my mind, I have such fond memories of the Broadway version of “Man Of La Mancha” that I held out hope “The Man Who Killed Don Quixote” would live up not to Gilliam’s previous work, but to the magic of that musical — and the original source material, written more than 500 years ago and considered the first modern novel, so popular it has been translated into more languages than any other book except the Bible. Unfortunately, the finished product of Gilliam’s movie turns an impossible dream into an unwatchable nightmare. I almost enjoyed Pryce’s broad, scenery-chewing work as Quixote, but Gilliam’s script and vision let him down. Meanwhile, Driver — who’s been good in so many other movies — is completely miscast as Toby, a director who once made a student film in Spain with an old shoemaker he convinced to play Quixote. Now, ten years later, Toby is back in Spain shooting a commercial. When he realizes the location is near the town where he’d shot before, he wanders off on a borrowed motorcycle to see if the cobbler is still around. Of course, he finds him, but time has taken its toll on the the old man’s mind to the point where he believes himself to really be Quixote. Soon, he’s off on madness-infused adventures and, of course, Toby goes along as his Sancho Panza. Regrettably, that’s all I can explain to you about the plot, because it gets so weird that I counted 11 times where I thought to myself, “WTF is going on?” Why does Toby stumble into a mine and find a dead horse with ancient Spanish coins in its belly? Why are Muslims, hiding from persecution from Christian militiamen, aging wine in giant pig bladders? Why is there a Russian oligarch involved, with a huge costume party at the end? Why are any of the young women pulled along with these exploits (purely as the targets of objectification), including one who is forced to lick food off the boot of the Russian? If this was supposed to be about a guy trying to make a commercial, why is that project completely forgotten? I have no answers, merely disappointment. I give “The Man Who Killed Don Quixote” a 1 out of 10, the only movie thus far this year to receive my lowest rating. In the end, Gilliam’s effort to slay his own giant instead ended up nothing more than a weak windmill that is only a threat to those forced to watch it. The good news is that you won’t have to worry about getting that opportunity, because there are no plans to release this “Quixote” anywhere anytime soon. My wife and I saw it in a one-night-only screening that drew exactly 8 people, all of whom joined us at the end in silent despair for having wasted two hours of our lives. Desperate for something to wash the experience out of my brain, I went home and found a streaming version of the original Broadway cast album on Amazon Prime Music — still as great as I remembered it.